Whole grains are great for cardiovascular health, which means good blood flow to the brain. 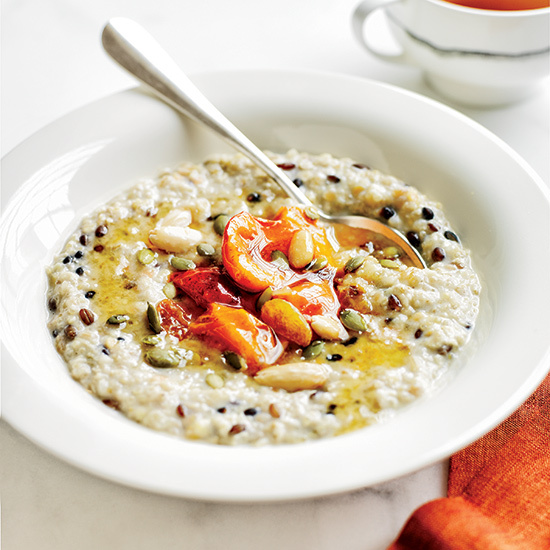 This quick porridge is packed with lots of good-for-you grains and comes together in just 15 minutes. Substitute pumpkin puree for the banana; top with roasted pepitasand drizzle with pumpkin seed oil. Stir in coconut milk; top with toasted coconut flakes and kiwi, mango and pineapple slices. Mix in baked diced apples and top with pieces of baked pie crust. Skip the banana; instead, stir in more oats during cooking to thicken the porridge; top with a poached egg, sesame seeds and scallions; drizzle with sesame oil. Stir in nut butter and grape jelly; top with chopped peanuts.